Mash cooked potatoes. In a pan, add 3 tsp of oil and splutter mustard seeds, urad dal and channa dal. Add curry leaves, onion, ginger, green chilies, green peas, carrots and cooked potatoes. Sauté well along with salt and dry powders (turmeric, masala) and coriander leaves. Heat the dosa pan. Pour a spoon of batter and spread the dosa. 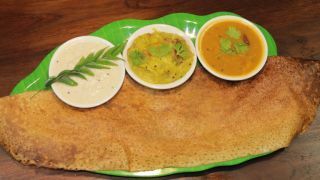 Fill the center of the dosa with the prepared masala. Pour oil around the dosa and fold one side above the other. Fry dosa as required. Tasty masala dosa is ready.